Hi, everybody! It's Broni here! Recently I needed to make an Autumn card. And, you know, every once in a while I just like to get really inky! I spread several different colors of Distress inks (shown below) onto my craft sheet, spritzed with some water, and laid my Sticky-Backed Canvas ATC and my Maya Road Mini Canvas Tag into the ink. I picked them up, dried them with my heat gun, and then repeated the process until I got the saturated look that I wanted. 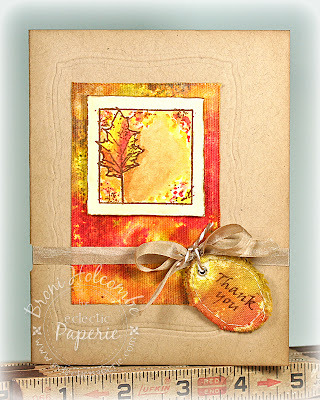 After embossing the kraft card base with a Spellbinders die, I adhered the canvas, using the embossing as a frame. 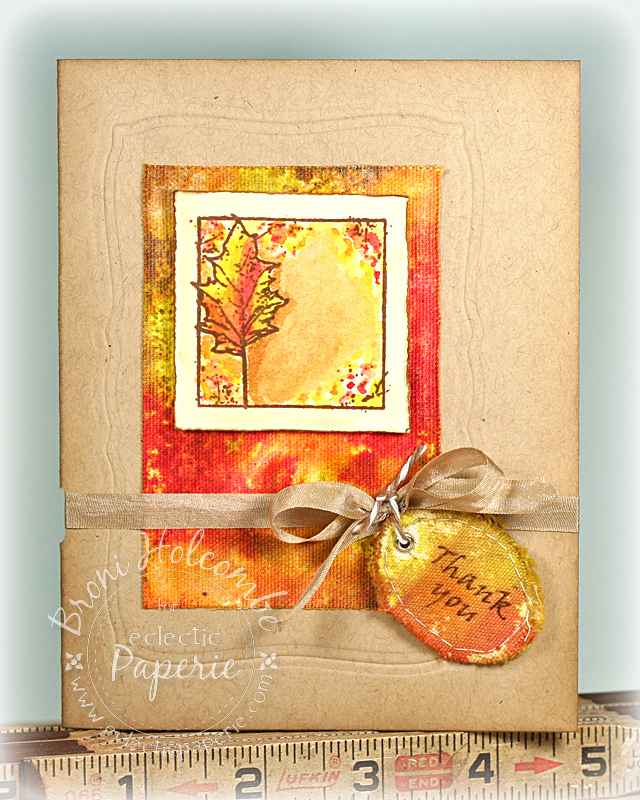 I stamped the framed leaf onto a Manila ATC in Archival coffee ink, and painted with the same Distress inks as above. I cut it out and mounted it with Scotch foam mounting tape. I also stamped the sentiment onto the canvas tag using the same ink. After tying the ribbon around the card front, I attached the canvas tag with a piece of Cappuccino twine. It's also attached with mounting tape. It took a little while for all the ink to wear off of my fingers when I was through. But it was worth it! Have a great weekend.....and get inky! So "warm" and pretty ! So pretty. Thanks for sharing. Oh Broni!!! I love that you got all inky and the colors are so gorgeous!. Great card...thanks for the inspiration! Work Less, Fish More... every man's dream! Introducing....New DT Member & New eKits! !